"At Shinola quality and dedication to craft is of utmost importance. We value the process of making things and embrace analog versus digital in many things we do. We love the emotion and texture that can be achieved with shooting on film. There’s a permanence that you don’t quite get with digital." 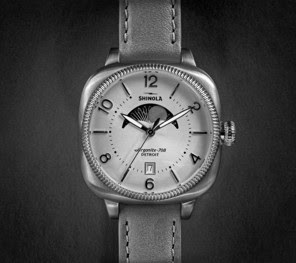 Shinola basically reached the conclusion that, since their watches are crafted by hand using all traditional materials, they wanted the photographs to be originated the same way. Is it just me or does it seem that this sort of statement is becoming more common? "I’m a traditional black and white film photographer. Film photography carries a very special place in my heart. I believe that there is nothing like the look of black and white film. "Shooting the photograph is just one step into the final look of my images. I enjoy every part of the process, from choosing the film, to developing it and printing it in my wet darkroom. In the end every step defines the look of my images, and that is what I love about film. “Shooting in black and white allowed us to focus on the shape, form, texture and light without the color distraction, not to mention that metal and reflections look great in black and white. Using film and wet darkroom printing was a way to continue their tradition of handcrafted products assuring that the final art will stand on its own." I agree with Augusto that it's the whole process of film photography - right from the moment I crack open a carton of film to pulling a print from the fix - that makes it more engaging and compelling than digital for me. Augusto stuck rigidly with Ilford products for the shoot using HP5 Plus in his Hasselblad 500CM and making the prints on Classic, Cooltone and Warmtone papers. The fine art finished prints are being used for the interior and exterior displays at the Shinola shops in Detroit, New York and London. Yep - I'm with you on this - you can't beat hand-crafting a print - though sadly most photograhers miss out on it. Incredible how many good darkrooms have been broken down in recent years. Malarkey! The Shinola watches are driven by an inexpensive Rhonda quartz movement. It's all marketing,smoke and mirrors. A cheap quartz movement is far from a handmade masterpiece or even a top shelf quartz like Seiko's Grand Seiko line. While they are generally more accurate than mechanical movements they are hardly masterpieces of the watchmakers art. I like the idea of using a film photographer however it's only a marketing ruse to obfuscate the truth of a marketing philosophy. What Michael said. When they first came out I was almost suckered in, then I did my research. Over-priced schlock. And this campaign is more BS. If they were truly that committed their whole website would be done with analog film, but take a look, it's all digital. They used to make shoe polish. I am glad that the company chose to have their products taken with B/W film rather than digital, but somewhat surprised that the photographer chose an ISO 400 film. I like HP5 Plus very much, but would probably have used Delta 100 or Pan F Plus to resolve the finest details of a particular product item.